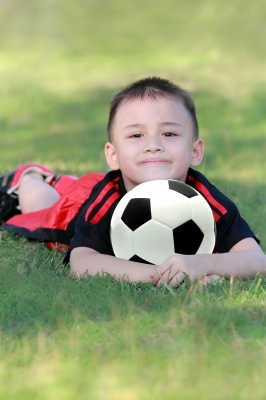 Making jerseys for your child’s sports team doesn’t have to be expensive. If you buy wholesale shirts in bulk, customizing them for each child can be a fun activity for the whole team, and can be done in as little as an afternoon. The first thing you’ll need to do is have a file on your computer with your team logo on it. Do not use any images that are protected by copyright in your logo! If you need one, check out the great selection of available, free logos online. Once you have your logo and team name set, print the design on the fusible paper. While you are at the computer, also print out the numbers for each shirt as large as you can. Cut out the designs with scissors– this might be best left to the grownups. Cut as close to each design as possible so that a large boarder won’t be transferred onto the front of the shirt. Follow the instructions on the printer paper to iron the design to the front of the shirt. On the back of the shirt, position the iron-on letters across the shoulders. Some teams may not want their kids’ names on their backs. That is ok! Iron the printed-out numbers onto the back of the shirt as well, following the directions from the package while you do. At this point, the kids can use the puff paint to customize their own shirts. Outlining the designs, numbers, and letters in the color of their choice is a great way to express individuality while really making the shirts pop. Make sure that you let the puff paint dry before you turn the shirt over, and that the shirts are totally dry before the kids put them on. Once that’s done, you’ll have a happy team clad in great-looking uniforms!